Abraham, W.R. (2001). Bioactive sesquiterpenes produced by fungi: Are they useful for humans as well? Current Medical Chemistry, 8, 583-606. Ander, P. and Eriksson, P.-E. (1984). Methanol formation during lignin degradation by Phanerochaete chrysosporium. Applied Microbiology and Biotechnology, 21, 96-102. Arora, A., Nain, L. and Gupta, J.K. (2005). Solid-state fermentation of wood residues by Streptomyces griseus B1, a soil isolate, and solubilization of lignins. World Journal of Microbiology and Biotechnology, 21, 303-38. Barron, G.L. (1988). Microcolonies of bacteria as a nutrient source for lignicolous and other fungi. Canadian Journal of Botany, 66, 2505-2510. Barron, G.L. (2003). Predatory fungi, wood decay, and the carbon cycle. Biodiversity, 4, 3-9. Bertaux, J., Schmid, M., Hutzler, P., Hartmann, A., Garbaye, J. and Frey-Klett, P. (2005). Occurrence and distribution of endobacteria in the plant-associated mycelium of the ectomycorrhizal fungus Laccaria bicolor S238N. Environmental Microbiology, 7, 1786-1795. Bessette, A.E. (1984). Distribution of brown blotch bacteria in wild and cultivated species of basidiomycetes. Applied and Environmental Microbiology, 48, 878-880. Bianciotto, V. and Bonfante, P. (2002). Arbuscular mycorrhizal fungi: A specialized niche for rhizo-spheric and endocellular bacteria. Antonie van Leeuwenhoek, 81, 365-371. Booth, I.R. (1985). Regulation of cytoplasmic pH in bacteria. Microbiological Reviews, 49, 359-378. Brunner, A. and Kimmins, J.P. (2003). Nitrogen fixation in coarse woody debris of Thuja plicata and Tsuga heterophylla forests on northern Vancouver island. Canadian Journal of Forest Research, 33, 1670-1682. Burnes, T.A., Blanchette, R.A. and Farrell, R.A. (2000). Bacterial biodegradation of extractives and patterns of bordered pit membrane attack in pine wood. Applied and Environmental Microbiology, 66, 5201-5205. Cho, Y.-S., Kim, J.-S., Crowley, D.E. and Cho, B.-G. (2003). Growth promotion of the edible fungus Pleurotus ostreatus by fluorescent pseudomonads. FEMS Microbiology Letters, 218, 271-276. Clausen, C.A. (1996). Bacterial associations with decaying wood: A review. International Biodeterioration and Biodegradation, 37, 101-107. Cowling, E.B. and Merrill, W. (1966). Nitrogen in wood and its role in wood deterioration. Canadian Journal of Botany, 44, 1539-1544. Daniel, G. (2003). Microview of wood under degradation by bacteria and fungi. In: Wood Deterioration and Preservation, Advances in Our Changing World (B. Goodell, D.D. Nicholas and T.P. Schultz, eds. ), pp. 34-72. ACS Symposium Series 845. De Boer, W., Folman, L.B., Summerbell, R.C. and Boddy, L. (2005). Living in a fungal world: Impact of fungi on soil bacterial niche development. FEMS Microbiology Reviews, 29, 795-811. De Boer, W., Klein Gunnewiek, P.J.A. and Laanbroek, H.J. (1995). Ammonium-oxidation at low pH by a chemolithotrophic bacterium belonging to the genus Nitrosospira. Soil Biology and Biochemistry, 27, 127-132. Dedysh, S.N., Khmelenina, V.N., Suzina, N.E., Trotsenko, Y.A., Semrau, J.D., Liesack, W. and Tiedje, J.M. (2002). Methylocapsa acidiphila gen. nov., sp. nov., a novel methane-oxidizing and dinitrogen-fixing acidophilic bacterium from Sphagnum bog. International Journal of Systematic and Evolutionary Microbiology, 52, 251-261. Godfrey, S.A., Harrow, S.A., Marshall, J.W. and Klena, J.D. (2001). Characterization by 16S rRNA sequence analysis of pseudomonads causing blotch disease of cultivated Agaricus bisporus. Applied and Environmental Microbiology, 67, 4316-4323. Goodfellow, M. and Williams, S.T. (1983). Ecology of actinomycetes. Annual Review of Microbiology, 37, 189-216. Gramms, G. (1987). The influence of the concomitant microflora on the establishment and dieback of decay fungi in standing timber. Journal of Phytopathology, 120, 205-215. Gramms, G., Voigt, K.-D. and Kirsche, B. (1999). Degradation of polycyclic aromatic hydrocarbons with three to seven aromatic rings by higher fungi in sterile and unsterile soil. Biodegradation, 10, 51-62. Greaves, H. (1970). The effect of selected bacteria and actinomycetes on the decay capacity of some wood-rotting fungi. Material und Organismen, 5, 265-279. Greaves, H. (1971). The bacterial factor in wood decay. Wood Science and Technology, 5, 6-16. Heilmann-Clausen, J. and Boddy, L. (2005). Inhibition and stimulation effects in communities of wood decay fungi: Exudates from colonized wood influence growth by other species. Microbial Ecology, 49, 399-406. Hendrickson, O.Q. (1991). Abundance and activity of N2-fixing bacteria in decaying wood. Canadian Journal of Forest Research, 21, 1299-1304. Henningsson, B. (1967). Interactions between micro-organisms found in birch and aspen pulpwood. Studia Forestalia Suecica, 53, 1-32. Hoekstra, E.J., Verhagen, F.J.M., Field, J.A., De Leer, E.W.B. and Brinkmans, U.A.T. (1998). Natural production of chloroform by fungi. Phytochemistry, 49, 91-97. Hoffmeister, M. and Martin, W. (2003). Interspecific evolution: Microbial symbiosis, endosymbiosis and gene transfer. Environmental Microbiology, 5, 641-649. Izumi, H., Anderson, I.C., Alexander, I.J., Killham, K. and Moore, E.R.B. (2006). Endobacteria in some ectomycorrhiza of Scots Pine (Pinus sylvestris). FEMS Microbiology Ecology, 56, 34-43. Janse, B.J.H., Gaskell, J., Gaskell, J., Cullen, D., Zapanta, L., Dougherty, M.J. and Tien, M. (1997). Are bacteria omnipresent on Phanerochaete chrysosporium Burdsall? Applied and Environmental Microbiology, 63, 2913-2914. Jurgensen, M.F., Larsen, M.J., Wolosiewicz, M. and Harvey, A.E. (1989). A comparison of dinitrogen fixation rates in wood litter decayed by white-rot and brown-rot fungi. Plant and Soil, 115,117-122. Kallionen, A., Vaari, A., Ratto, M., Konn, J., Siika-aho, M. and Viikari, L. (2003). Effects of bacterial treatments on wood extractives. Journal of Biotechnology, 103, 67-76. Kirby, R. (2006). Actinomycetes and lignin degradation. Advances in Applied Microbiology, 58, 125-168. Lang, E., Kleeberg, I. and Zadrazil, F. (1997). Competition of Pleurotus sp. and Dichomitus squalens with soil microorganisms during lignocellulose decomposition. Biosource Technology, 60, 95-99. Lebow, S., Foster, D. and Evans, J. (2004). Long-term soil accumulation of chromium, copper and arsenic adjacent to preservative-treated wood. Bulletin of Environmental Contamination and Toxicology, 72, 225-232. Lim, Y.W., Baik, K.S., Han, S.K., Kim, S.B. and Bae, K.S. (2003). Burkholderia sordidicola sp nov., isolated from the white-rot fungus Phanerochaete sordida. International Journal of Systematic and Evolutionary Microbiology, 53, 1631-1636. Lincoln, S.P., Fermor, T.R. and Tindall, B.J. (1999). Janthinobacterium agaricidamnosum sp. nov., a soft rot pathogen of Agaricus bisporus. International Journal of Sytematic Bacteriology, 49, 1577-1589. Lindahl, B.D. and Finlay, R.D. (2005). Activities of chitinolytic enzymes during primary and secondary colonization of wood by basidiomycetous fungi. New Phytologist, 169, 389-397. Liu, J.-K. (2005). N-containing compounds of macromycetes. Chemical Reviews, 105, 2723-2744. Lorenzen, K. and Anke, T. (1998). Basidiomycetes as a source for new bioactive natural products. Current Organic Chemistry, 2, 329-364. Lumini, E., Ghignone, S., Bianciotto, V. and Bonfante, P. (2006). Endobacteria or bacterial end-osymbionts? To be or not to be. New Phytologist, 170, 205-208. Murray, A.C. and Woodward, S. (2003). In vitro interactions between bacteria isolated from Sitka spruce stumps and Heterobasidion annosum. Forest Pathology, 33, 53-67. Noble, R., Fermor, T.R., Lincoln, S., Dobrovin-Pennington, A., Evered, C. and Mead, A. (2003). Pri-mordia initiation of mushroom (Agaricus bisporus) strains on axenic casing materials. Mycologia, 95, 620-629. Oberg, G., Brunberg, H. and Hjelm, O. (1997). Production of organically-bound chlorine during degradation of birch wood by common white-rot fungi. Soil Biology and Biochemistry, 29, 191-197. Payne, C., Bruce, A. and Staines, H.J. (2000). Yeast and bacteria as biological control agents against fungal discolouration of Pinus sylvestris blocks in laboratory-based tests and the role of antifungal volatiles. Holzforschung, 54, 563-569. Rainey, P.B., Cole, A.L.J., Fermor, T.R. and Wood, D.A. (1990). A model system for examining involvement of bacteria in basidiome initiation of Agaricus bisporus. Mycological Research, 94,191-195. Schmidt, O. (2006). Wood and Tree Fungi. Biology, Damage, Protection, and Use. Springer, Heidelberg. Seigle-Murandi, F., Guiraud, P., Croizee, J., Falsen, E. and Eriksson, K.-E. (1996). Bacteria are omnipresent on Phanerochaete chrysosporium Burdsall. Applied and Environmental Microbiology, 62, 2477-2481. Smith, J.D. (1980). Is biological control of Marasmius oreades fairy rings possible? Plant Disease, 64, 348-354. Soler-Rivas, C., Jolivet, S., Arpin, N., Olivier, J.M. and Wichers, H.J. (1999). Biochemical and physiological aspects of brown blotch disease of Agaricus bisporus. FEMS Microbiology Reviews, 23, 519-614. Tornberg, K. and Olsson, S. (2002). Detection of hydroxyl radicals produced by wood-decomposing fungi. FEMS Microbiology Ecology, 40, 13-20. Tsukamoto, T., Murata, H. and Shirate, A. (2002). 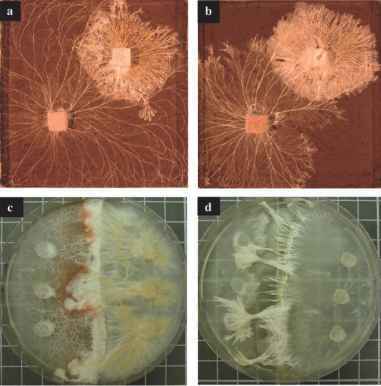 Identification of non-pseudomonad bacteria from fruit bodies of wild Agaricales fungi that detoxify tolaasin produced by Pseudomonas tolaasii. Bioscience, Biotechnology and Biochemistry, 66, 2201-2208. Tsukamoto, T., Takeuchi, M., Shida, O., Murata, H. and Shirata, A. (2001). Proposal of Mycetocola gen. nov in the family Microbacteriaceae and three new species, Mycetocola saprophilus sp nov., Mycetocola tolaasinivorans sp nov and Mycetocola lacteus sp nov., isolated from cultivated mushroom, Pleurotus ostreatus. International Journal of Systematic and Evolutionary Microbiology, 51, 937-944. Tsuneda, A. and Thorn, G. (1994a). Interactions between Lentinula edodes and pseudomonads. Canadian Journal of Microbiology, 40, 937-943. Tsuneda, A. and Thorn, G. (1994b). Interactions of wood decay fungi with other microorganisms, with emphasis on the degradation of cell walls. Canadian Journal of Botany, 73(Suppl. 1), S1325-S1333. Verhagen, F.J.M., Swarts, H.J., Wijnberg, J.B.P.A. and Field, J.A. (1998). Organohalogen production is a ubiquitous capacity among basidiomycetes. Chemosphere, 37, 2091-2104. Watkinson, S.C., Burton, K.S. and Wood, D.A. (2001). Characteristics of intracellular peptidase and proteinase activities from the mycelium of a cord-forming wood decay fungus, Serpula lacrymans. Mycological Research, 105, 698-704.